If kids really are to eat more healthfully, food and beverage companies have to stop pushing products at them. But if companies don’t market to kids, they lose money. Regulation would solve the problem, but is not politically feasible. Voluntary efforts are limited to companies that agree to participate. Short of regulation, what more can be done? This invitation felt like history in the making. I accepted with pleasure. Mrs. Obama’s speech alone was well worth the trip. You can see it for yourself thanks to Eddie Gehman Kohan, who posted a video and a transcript of the speech on her ObamaFoodorama site. And I’m here today with one simple request — and that is to do even more and move even faster to market responsibly to our kids…the goal here is to empower parents instead of undermining them as they try to make healthier choices for their families. And we need you to lead the way in creating demand for healthy foods so that kids actually start “pestering” us for those foods in the grocery store. And then parents actually start buying them, and then companies have incentives to make and sell even more of those foods. And ideally, in a decade or so, we would see a dramatic shift across the entire industry. We’d see companies shifting marketing dollars away from those less healthy products and investing those dollars in your healthier products instead…See, the decisions that you make about marketing won’t just affect what our kids are eating today — those decisions are going to also affect the health of your workforce tomorrow…. You see, over the past few years, we’ve seen some real changes in the foods our kids are eating, starting from the time they’re born…this isn’t just some passing trend or fad. So there might be those out there whose strategy is to just wait this out — folks who might still be thinking to themselves, well, in a few years, this lady will be gone — (laughter) — and this whole Let’s Move thing will finally be over, so we can go back to business as usual. And I know that none of you here are thinking that way. (Laughter.) But if you know anyone who is — (laughter) — you might want to remind them that I didn’t create this issue, and it’s not going to go away three and a half years from now when I’m no longer First Lady. Obama Foodorama also posts the list of who attended. This was a diverse group of representatives of the food industry, trade associations, media, government agencies, private organizations, and universities who sought common ground. Some food companies are making substantial progress in trying to reduce their marketing of less healthful foods. Advocates wish they would do more, faster. The business barriers are formidable. I think it’s wonderful that the First Lady is taking on this critical topic, impressive that such diverse opinions were represented, and remarkable that this meeting, if nothing else, holds the possibility of opening the door to further discussion. Center for Science in the Public Interest has some suggestions for what the next steps should be. Cheers to Let’s Move! for taking this on. It’s been more than three years since Michele Obama’s speech to the Grocery Manufacturers Association about the unhealthy effects of their food marketing on kids. But she’s back, this time talking to an audience representing specific targets of food industry marketing—Hispanics. While we still have a long way to go, the good news is that right now, we have everything we need to reclaim our children’s health — that is, if we’re willing to step up and continue to do our part in our own families and communities. And that starts by using our power as consumers to hold companies responsible for the food they make and how they market it to our kids. In 2008 alone, companies spent well over half a billion dollars on food, beverage and restaurant ads in Latino media markets — many of them for unhealthy products. And those of us with kids who have seen our kids begging and pleading for something they saw on TV, we know just how persuasive these ads can be. So we all know that the food industry has some serious work to do when it comes to how they market food to our kids. But here’s the thing — ultimately, we all have the power to decide whether or not to actually buy those foods…Goya can produce low-sodium products, but if we don’t buy them, they will stop selling them…. OK, so she’s not exactly calling for boycotts or talking about legislation that might put some limits on food industry marketing. But reading between the lines, it comes pretty close. I’ve just been sent a new report on the current status of marketing foods and beverages to children at school: Promoting Consumption at School: Health Threats Associated with Schoolhouse Commercialism. This report, from the National Education Policy Center at University of Colorado, Boulder, makes sobering reading. 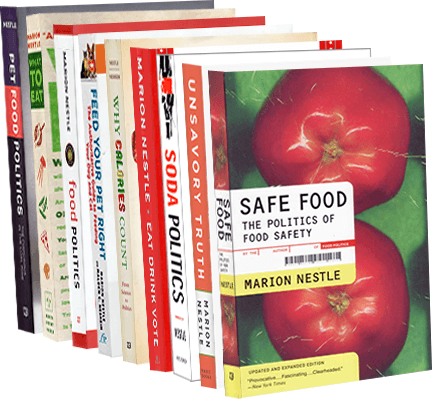 In their quest for additional funding, many schools and school districts have allowed corporations to promote the consumption of sweetened beverages and foods of little or no nutritional value in school and in conjunction with school projects…corporations can seem philanthropic when they provide sponsored educational materials…to schools and teachers. These materials can be colorful and engaging, and may align with state and now Common Core standards, but they also present a worldview consistent with that of the sponsor. If you think that the food companies are making good on their pledges to reduce marketing to kids, this report will make you think again. Available data suggest that the total amount of money spent on advertising food and beverages to children, both in and out of schools, has decreased over the past few years. However, any reduction in spending reflects at least in part a shift to less expensive, but more effective, alternative media advertising. Food and beverage companies advertise in schools in multiple ways: (1) appropriation of space on school property, (2) exclusive agreements, (3) sponsorship of school programs, (4) sponsorship of supplementary educational materials, (5) digital marketing, (6) sponsorship of incentive programs, and (7) fundraising. Teaching materials may not mention the sponsor but reflect the sponsor’s views, such as that all beverages count toward hydration. The report is a terrific summary of what’s happening with food marketing in schools, loaded with facts, figures, and references. Policymakers should prohibit advertising in schools unless the school provides compelling evidence that their intended advertising program causes no harm to children. What’s missing from this report is a blueprint for action. For that, you must go elsewhere, for example, to the Center for Science in the Public Interest, the Berkeley Media Studies Group, or the Rudd Center for Food Policy and Obesity. Do you know of other good sources for taking action on marketing in schools? Do tell. Beyoncé’s Pepsi deal: Implications for Let’s Move! How do you think the White House should respond to this deal.? Beyoncé’s song is featured on White House website and a Let’s Move! t-shirt she designed is given to kids at official events. Will kids make the connection? Can all that dancing overcome the effects of eating too much? Let me deal with these one at a time. First, the problem this poses to Let’s Move! People concerned about the role of sugary sodas in childhood obesity are appalled by Beyoncé’s deal with Pepsi, so much so that the Center for Science in the Public Interest has organized a campaign to call on her to reconsider. Unless she does reconsider and withdraws from the deal, her continued involvement with Let’s Move! raises exactly the questions you ask. Beyoncé has just put Let’s Move! in a painfully awkward conflict of interest. On the one hand, Let’s Move! promotes healthy diet and activity patterns to reverse childhood obesity. On the other, its celebrity spokesperson is now going to be pushing Pepsi. 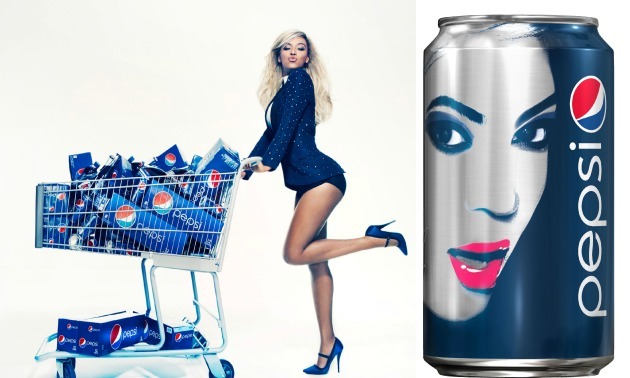 Beyoncé’s image will now appear on Pepsi cans—I hope not wearing her Let’s Move! tee shirt. What the Beyoncé deal points out is the hazard of partnerships and alliances between public health groups and food companies. But now this. The White House has long maintained that food and beverage companies are not going away and that it is obliged to work with them. Maybe, but on whose terms? I see Beyoncé’s $50 million partnership with Pepsi as a slap in the face to Let’s Move! It puts Let’s Move! in the position of promoting Pepsi or asking Beyoncé to withdraw from having anything to do with it. As for how kids are going to figure this out: All kids know is that Beyoncé is a gorgeous mega-star, one who is able to perform vigorous dance moves in astonishingly high heels, and that Pepsi helps her do so or at least doesn’t hurt. Beyoncé is especially a role-model for African-American kids. Pepsi targets its marketing to African-American kids. This looks like a serious conflict of interest. On the balance between diet and activity: How I wish that physical activity alone could reverse obesity. Physical activity is terrific for health (I’m not sure about those stiletto heels) but it’s rarely enough to reverse obesity on its own. To lose weight—and, these days, to maintain healthy weight—kids absolutely must eat less and eat better. Beyoncé has done Michelle Obama no favor by getting involved with Pepsi. This is a mess, and not one that can be gracefully fixed. It’s been awhile since Kerry Trueman posed an “Ask Marion” question, but here’s her latest Q and my A as posted on Civil Eats. Q. From the moment Beyoncé strapped on those silly stilettos to bounce around in the “Move Your Body” video, she’s been a wobbly spokesperson for Michelle Obama’s “Let’s Move Campaign.” Now she’s signed a $50 million dollar deal with Pepsi, which will presumably entail her exhorting her millions of young fans to baste their bodies in bubbly high fructose corn syrup. A. From my privileged position as a tenured, full-salaried faculty member at NYU, the answer is an unambiguous yes. Beyoncé will now be marketing sugar-sweetened beverages, products increasingly linked to childhood obesity, especially among minority children. I simply cannot believe that the Founding Fathers of the United States intended the First Amendment for this purpose. These papers are a great start to the conversation, as was a previous contribution from these authors: A Legal Primer for the Obesity Prevention Movement, American Journal of Public Health, 2009. First Amendment scholars: weigh in, please. I side with the American Psychological Association in thinking that advertising to children is unconscionable. Rather than dwell on the First Amendment issue, which strikes me as an easy case to make, I think it’s worth addressing a deeper question underlying the San Francisco cigarette-in-pharmacy ban: Why allow an industry that profits from the sale of unhealthy food at all?